In everyday life, it often happens that one would stop for a second and reflect, feeling a distressing emptiness. It's nothing you can touch, just a feeling from deep down inside of you that leads to melancholy and sadness for the loss of something or somebody beloved, somebody who meant a lot to you, whose loss still today affects your life. 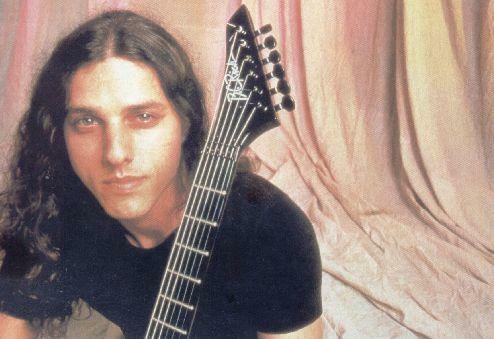 In these last two years, it's been natural to combat this feeling of emptiness to the face, the spirit, the music of Chuck Schuldiner. He was a rare kind of person in the music biz, a boy like many others, who, like few others, has written core pages in the book of metal, contagious with his enthusiasm and larger-than-life love for music, a "heavy metal kid" who was able to become an idol without changing his spirit, and that's the main reason why, even now, there are many who mourn the passing of a brother. Very often this mother avoided reporters due to past experiences, and for this the following interview gets even more important. "In the past I've been criticized for having been too available and talked too much about Chuck" - once she wrote in one of our many e-mails we exchanged - "But it's hard not being; he was the most interesting person I have ever known, and was a wonderful friend too, always there for his sister, nephew and me. Like his sister said, the sky is less blue without him and I feel the world without Chuck is very tough to face every day." A touching and moving depth, deriving from a strong dignity and great love for that son taken away from her too early, which is showed again in the next answers. In fact, it was December 13th 2001 when Chuck, silently, had finished being "just a musician" and became a legend. 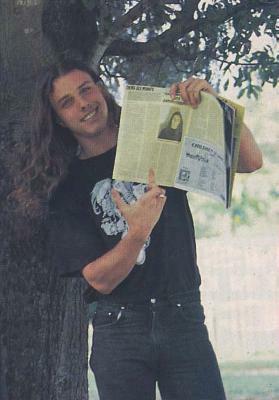 Today, two years after that sad day, Metal Hammer wants to pay homage to this wonderful person, taking aside the musical concern, Death, Control Denied and a sound that unfortunately won't be anymore, to let you know "the man" Chuck Schuldiner, a guy with his dreams and his fears, his loves and his passions, just like any of us. And who better than the person who gave birth to him could describe to us who Chuck actually was? 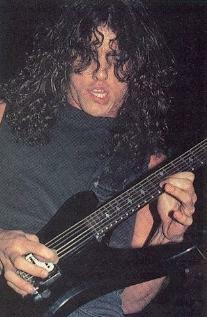 Jane Schuldiner is a woman tried by life, and her courage and kindness hits you; she's such an extraordinary person that makes it easy for you to remember in her words, that guy who gave us great emotions with his guitar. Chuck was a talented musician and writer as well as a very nice and caring guy to the many friends he had and the family he always put first in his life. He was truthful and honest and loving and he expected no less of any of us. How was he when he was a baby, a boy and then a man? Chuck was always friendly and smiling as a baby and through childhood. As a man, he was as I described in question #1, except he learned to be very selective in whom to trust. Was he a good student? And what about his relations with his friends? Chuck was a good student, never a problem. He was very popular and had many good memories of school and friends he met there that he kept all through his life. These friends were like an extended family and many are still in touch with me. Is it true that he started to play as a therapy for a psychological trauma? Yes, Chuck started playing after the traumatic death of his 16 year old brother. Do you remember when he was emotionally involved during a Kiss concert? Yes, Chuck was absolutely emotionally involved in the band Kiss. He went to all the concerts. They were the leader among the bands that had a great influence on him musically. He was a big fan of theirs and finally met them not long ago and found they knew who he was. He got to hang out and talk to them about music, and it was a thrill for him. Do you remember his first concert? Did you attend to it? What were your emotions? Yes, his first concert was at a local park with high school friends he played with at the time. I did attend and was so proud and excited, it was the only time I had the privilege of seeing him play in that way. I found a picture of that concert recently and I'm planning to share it on the emptywords site. Please, describe Chuck's normal day, seen by the eyes of a mother; was he quiet? Nervous? Kind? Aggressive? Or what else? Chuck's days at home were so normal, he had quite a few interests and was very busy. When he wasn't busy with his music, he loved to go antiquing, play with his pets, go to the beach, cook on the grill and cook wonderful meals in his kitchen and inviting friends and family over to eat, going to a movie or to the mall for Barney's coffee. I was a very fortunate mom, he invited me to join him a lot of the time. What about his "life philosophy"? I will say just one thing I observed as Chuck grew into the man he was. He consciously tried his best to right wrongs when he could, he tried to live and treat people and all he came across in this world as he wanted to be treated. And from the massive amounts of mail I receive to this day about the acts of kindness he gave to people all over the world, he made a difference. If you read his lyrics, his philosophy is there. What were his reactions to difficult situations (line-up changes... change of label...)? Was he resigned or "warlike"? I would say that when Chuck made those sometimes painful decisions it was hard for him, but necessary, he felt. It was a professional decision and Chuck did what he felt he had to do for the band no matter how tough it was , and obviously time told that it was best for the band and its success. The general opinion is that he was an extremely sensible and deep boy. Is it true? Yes, he was always that way. Was he the son that every mother would like to have? Yes, in every way, without a single doubt. Do you remember something said or written about him that made you proud to be his mother? Yes, when people Chuck met along the way write to share their feelings with me and tell me of how much Chuck affected their lives and how much they love him and will never forget him. That is the result of the the kind of man Chuck was and I am so very proud of him. If I seem unable to find a negative in Chuck, that is because there were none to be found in his life with us, his family. Do you remember when he realized that music was so important in his life? Chuck was 10 years old when he first began his interest in music, and it was the beginning of his career as it turned out to be more than a casual interest. He became deeply involved almost immediately and never stopped. Early in his teen years he was recording demos and reading all the music magazines he could find. He saved these magazines and I have them stored away for his nephew. The demos led to contact with people all over the US eventually. It was really great because he was very close to his brother and it helped to fill an empty space in his life. What was your position at that moment? Did you support him or not? His father and I always supported him 100% in his music and helped in any way we could. Did you ever hope or suggest to your son a more "regular" job? I never did, but Chuck did have a job for a short while. He was very busy with school and his music so we encouraged him to concentrate on those things. What was your opinion about such an extreme musical proposal like that of Death? Chuck's music was not metal at first, though it rapidly evolved into it. I didn't ever see anything wrong in it, then or now. I appreciated how it affected his life in a positive manner and led to a lot of socialization. The first concrete result of your son's choice was an album. What were your emotions when you saw and heard it for the first time? I was so proud!! As corny as it may sound, his father and I had a cake baked with a record and #1 printed on it. On the emptywords site is a picture of that happy day. Fortunately Chuck was very indulgent with us and loved our enthusiasm for his accomplishments, big and small. Did he play when he was angry? Yes, sometimes. He also played when he was happy as well, and just for the sheer joy of it. He had fulfilled his dream of a studio of his own and spent many hours in it, sometimes all night, playing his guitar and composing. He was happy that he was able to help bands that were just beginning their careers in that studio. 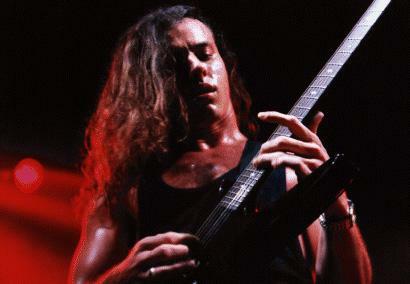 And what is your opinion about the long lasting memory of Chuck in the metal music scene? I know from experience that the people in metal are very dedicated to their music and one thing I have seen a lot, they close ranks in times of need. I met so many wonderful unforgettable people. Chuck always said they are like a big family, and I have seen proof that this is so. I may never see any of them again but I will always feel close to Chuck's metal friends. The dedication of metal fans all over the world is enormous, metal music is very important to them and many write and tell me their children are being introduced to it. Just think of that, another generation. What was the meaning of "success" for Chuck? Success for Chuck was not financial. Sure he wanted to be comfortable, but his idea for success was exactly what he had, acknowledgment for his efforts from the ones who made it all possible, his fans. Truly. He always said that if he could just tour and play for them, skipping all the in-between people, he would be a happy man. Did he realize he would be an example not only for other groups but also for his many fans? That was always a consideration for Chuck. He was very proud when many of the bands and fans out there wrote to him and told him that he was their inspiration. Many have written that the messages in Chuck's lyrics were important for them in troubled times, as they still are. And for me as well. I remember the lyrics that I found so moving. In essence, it was "Rivers of sorrow, oceans deep with hope." That was Chuck's life in the music world, and the personal tragedies in his life. Fortunately he focused more on the oceans of hope. Did you ever hear him say "And now I'm on the top"? What was his and your reaction to the terrible announcement of his disease? So many emotions for me, rejection, doom, sorrow, catastrophic fear. Of course Chuck had to have felt some of that, but he never showed it to us, his family, or anyone else that I know of. His thoughts were of how we felt and, as hard as it was, that gave me the strength to control myself, for him, and join his fight to recover. An ocean of hope was what we all had for that recovery. Was he sufficiently strong to face such a terrible reality? Yes, he was. His doctors, nurses, all the people who came in contact with Chuck in that horrific time were amazed at his fortitude and consideration for them when he was so sick himself. He made many new fans of another kind during that time, and they loved him. There was real grief and tears among them when Chuck lost that fight. We still hear from the medical community, they remember him with fondness. When these accidents happen, normally people wonder "Why me?" "Why to my boy?". Could you find an answer to those questions? Did you ever feel like"mother courage"? No, I persevered for Chuck, courage had nothing to do with it. Did someone psychologically help you to overcome this pain? No, there is no overcoming this pain. Among all mothers who lost their sons, don't you think you're lucky because Chuck's music, voice, video and the hearts of his fans let him continue to live among us? Yes, I am so very thankful for that, it is the greatest comfort I have since the loss of Chuck and extremely important to me. Thank you. Chuck's sister posed a question to me, would we miss Chuck so much if he had not been the person he was, and I can only say that it is not possible to miss him more.